Cades Cove Campground features 159 sites and accommodates tents and RVs up to 35-feet. It is open year-round and offers a Camp Store. For reservations, call 877-446-6777 or visit www.recreation.gov. The Anthony Creek Horse Camp is located nearby and offers access to the back country. To reserve a site, call 877-446-6777 or visit www. recreation.gov. 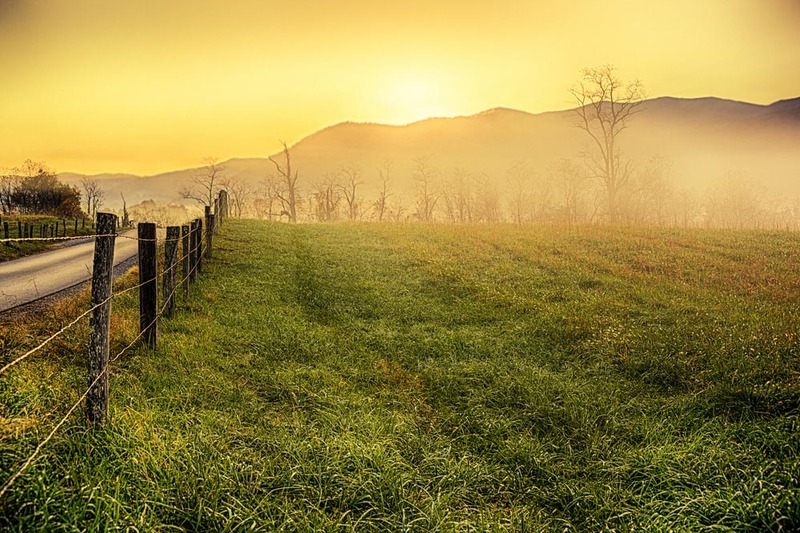 There are many miles of trails for day hikers, backpackers, and horses that can be accessed in Cades Cove. Here are a few of our favorites. The Abrams Falls trailhead is located between signposts #10 and #11 about five miles into the one-way Cades Cove Loop Road. This popular trail to the picturesque falls, which drop 20-feet into a deep pool, is a great hike in any season. Please don’t climb on the slippery rocks around the falls or swim in the pool (the undertow has caused drownings!) Beautiful evergreen rhododendron line the trail before it passes over a low pine ridge which offer a wonderful display of spring wildflowers. Beyond the falls, the trail continues another 1.7 miles to intersect with Hannah Mountain and Hatcher Mountain Trails which lead to an area of the gorge where an EF4 tornado hit in April 2011. In some places every single tree was knocked down. The Cades Cove Nature Trail is found at signpost #13 on the Loop Road. This short walk in the woods is a nice spot to stretch your legs any time of the year. Gregory Bald is a 10-acre grassy meadow where in June you’ll discover a display of native flame azaleas that you won’t find anyplace else in the world. For years the azaleas have hybridized to form an array of colors in shades of red, orange, yellow, pink, and white. In August, Gregory Bald is full of ripe blueberries. However, any time of the year, the views from Gregory Bald are remarkable. On the way to the top, you’ll hike through an old-growth forest that contains some large hemlock trees. 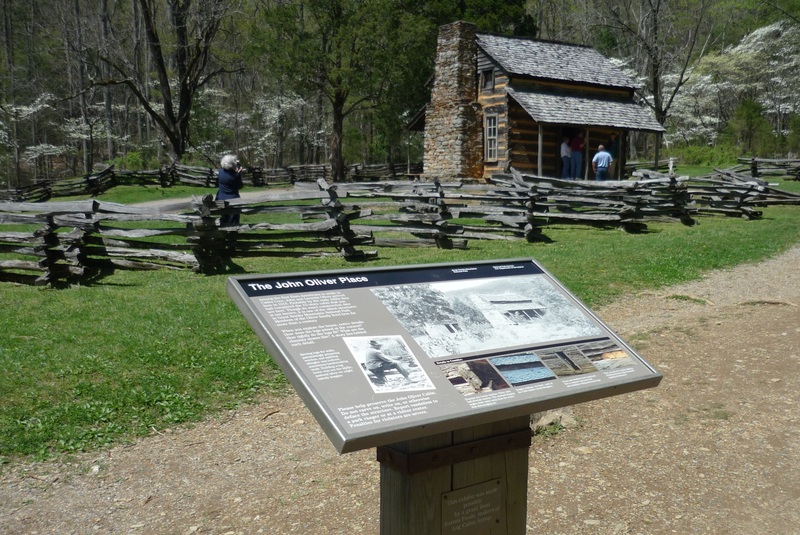 To access the Gregory Bald Trail, take the Cades Cove Loop to the Visitor Center at Cable Mill area. Just past the main parking lot, follow the signs to Forge Creek Road (will be on your right) that will take you to Parsons Branch Road. Once on Parsons Branch Road, drive 3.3 miles to Sam’s Gap where the Gregory Bald Hiking Trail begins. Please note that Parsons Branch Road is one-way and closed in winter. This trail is used by both horses and hikers. To access the Gregory Ridge Trail, take the Cades Cove Loop to the Visitor Center at Cable Mill area. Just past the main parking lot, follow the signs to Forge Creek Road/Parsons Branch Road (will be on your right). Drive 2.2 miles to reach the Gregory Ridge Trailhead. Just before you reach the parking area, Parson Branch Road forks off to the right. You should continue on the two-way Forge Creek Road for just a short distance to reach the Gregory Ridge Trail parking area. This trail is used by hikers only. It’s worth noting here that even though the Gregory Bald Trail is a shorter hike to Gregory Bald, your committed to driving the one-way Parsons Branch Road that exits the southwest corner of the park on Highway 129. To access this trailhead, park at the Information Shelter at the beginning of Cades Cove Loop Road. Cross the road and walk just into the cove and you’ll see the trail sign. This trail accommodates both hikers and horses, and crosses three different creeks a total of six times. After the first half mile veer left at the junction with Crooked Arm Trail to stay on Rich Mountain Loop Trail. At mile 1.4 you’ll come upon the John Oliver Cabin. Then you climb Cave Ridge; although steep you’ll enjoy wildflowers in spring and summer. And at mile 3.0, you’ll find an amazing view of Cades Cove in any season. You intersect Indian Grave Gap Trail .3 mile further. Continue to the right on Indian Grave Gap Trail for approximately 2.6 miles to intersect with Crooked Arm Ridge Trail. Take a right on it and go 2.2 miles down the mountain to intersect with Rich Mountain to complete your loop. From here, it’s about a half-mile back to the parking log. History lingers in Cades Cove. Listen carefully and you can almost hear faint voices call across a sun-dappled meadow. Look closely and you might see a shadowy shape holding the reins and plowing a misty field, while just along the forest’s edge a small band of Cherokee drift across a path once trod by hundreds of their tribesmen. John Oliver , a veteran of the War of 1912, and his wife Lucretia were the first permanent European settlers in the Cove. In 1821, William Tipton, a veteran of the American Revolution, bought large tracts of the cove and sold them to friends and relatives. Peter Cable, a Pennsylvania Dutch farmer who was familiar with dykes, designed a system that drained swampy lands in the Western part of the cove, opening up even more fertile areas to farming. By 1827, the cove boasted a forge for building metal tools, a tub mill, and a grist mill. In 1850, the cove was home to more than 650 residents who lived on farms averaging between 150 and 300 acres. With few exceptions, residents of the cove were staunchly pro-union during the Civil War. Rebel forays into the cove killed any Union sympathizer crossing their path and wreaked havoc with livestock. According to Wikipedia , the cove suffered the economic effects of the Civil War well into the 19th century. Farming was less productive and the population did not return to pre-war levels until about 1900. Perhaps because of its long history, its isolation, and close knit community, cove residents resisted more vehemently than any other area when the idea of a National Park was proposed, and were initially assured that their land would not be incorporated. However in 1927, the Tennessee General Assembly approved money to buy land for the national park, and gave the Park Commission the power of eminent domain which allowed them to seize properties within the proposed park boundaries. The original plan called for allowing the cove to return to a natural forested state, but was later revised to include demolishing more modern structures and leaving only the primitive cabins and barns that most represented a pioneer lifestyle. Check out this video of the sights and sounds of Summer fun in Cades Cove! Enjoy a Drive on Scenic Highway 129 near the Great Smoky Mountains and Experience the Tail of the Dragon!